If 2007 could boast just one standout homily from an American prelate, the prize would belong to Pittsburgh. Lasting all of 15 minutes at its core, Bishop David Zubik's off-the-cuff homecoming message at his late September installation (fulltext/video) was the sort of encouraging challenge an incoming pastor could only give to a people he already knew and loved... and who already knew and loved him. Some installees might succumb to the various temptations of going programmatic, speaking of how they look forward to getting to know everyone, or simply losing themselves in rhetorical flourishes. But the native son's mantra of renewal, that the church "need[s] to be excited about God" -- complete with the story of a plane encounter with cradle-Catholic-gone-Buddhist who said he hadn't "really found anybody who genuinely follows" Jesus -- raised the sights of those who heard it as few, if any, high-profile episcopal utterances had before or since. Suffice it to say, a few even wept on hearing it. The opening has since fleshed itself into a series of columns in the diocesan newspaper and a public schedule whose "chaotic" pace has led the locals to urge the bishop to take care of himself. Away from the spotlight, among other things, Zubik's one-on-one meetings with members of the 850,000-member diocese have seen him consult with priests and people alike for their thoughts on how he could be a better bishop for the church, the diocese, and for them personally. But while he's seen a lot at home these last four months, one thing Zubik hadn't seen for 25 years was the DC March for Life. After the vigil Mass, Bishop Zubik had joined the St. Vincent seminarians from Latrobe for a 1 a.m. Holy Hour in the Basilica crypt, where hundreds prayed all night or slept on the floor. Twenty-three of the diocese's 29 seminarians -- all but those in Rome -- joined him for the Masses and march. It was the bishop's first march in 25 years, because he had always stayed behind to work in administration so that his predecessors could attend. He didn't remember the earlier ones as nearly so organized -- or as youthful. The vast majority of those in attendance were 25 or younger. Bishop Zubik was one of just two bishops among 125 priests to volunteer to hear confessions in an arena restaurant, while Catholic rock bands revved up the crowds in their seats. The lines to see the confessors were about 50 deep at all times, and many teens were turned away when Mass began. Thousands more were turned away from the area itself when the 22,000 seating capacity was reached at 8:25. When he emerged from confession, Bishop Zubik was astounded to see them standing outside in a freezing drizzle because even the neighboring parishes that held overflow Masses were filled. "That was the first hint I had how huge this was," he said. Larry Adams, 41, who entered St. Paul Seminary three weeks ago from St. Germaine parish in Bethel Park, where he used to teach catechism, said he found himself crying at the enthusiasm of the youth. "To see kids that excited about their faith, and wanting to make a difference that's what you want to see as a teacher. I kept thinking, I wish I had my class with me." As he prepared to board a van back to Pittsburgh with his seminarians at 3:30 p.m., Bishop Zubik said he was feeling good and very upbeat, even though he had had no coffee or food. Although the March for Life marks a mournful occasion for its participants, its mood is upbeat. After 35 years, there are families that have participated for three generations, and Bishop Zubik had a sense that, if the legalization of abortion was overturned tomorrow, the marchers would return next year, in part because they enjoy it so much. No matter what happens legally, "this is not an issue that will ever go away. It's an issue that defines us as human beings," he said. 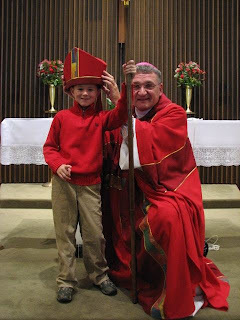 On a wider note, Zubik recently consulted the Pittsburgh priests on possible replacements for auxiliary Bishop William Winter, who retired in May 2005. In reality, however -- auxiliary appointments being what they are these days (i.e. an eternity in coming) -- the eventual nominee will likely end up succeeding one of the nation's top diocesan prospects: the Steel City's lone active auxiliary, Bishop Paul Bradley. A highly-regarded career pastor who became Vice-Wuerl on Zubik's 2003 appointment to Green Bay, Bradley won high praise for his 15-month stint as diocesan administrator between The Don's departure for the capital and The Dave's return home -- a rep reinforced when, at the latter's installation, the presbyterate led a prolonged standing ovation for the auxiliary that brought tears to his eyes. While it's said that Bradley's already popped up on a number of ternae, numerous ops foresee his most-likely destination as the vacant diocese of Charleston... and not just because of South Carolina's prominent Steeler Nation diaspora. Speaking of Southern vacancies... well, more on that later. On Day One, Father-General Looks to the "Nations"